What are you all using to sync your modular to the Digitakt? I'm wondering if the Expert Sleepers FH1 would be a good choice for doing that. I haven't used it yet, but it has extremely good feedback here in the General Gear section. Plus, it's low-cost and doesn't take up case space or power. Anyone knows if this box would also work nicely for midi lfo's? Because I read lfo's work well via Shuttle control or FH1. But this standalone box would be great for me.. I just got my digitakt and was really excited to use it in conjunction with my modular. I got the A-190-8 a while ago in anticipation of the digitakt too but I can't seem to get it working. Clock Receive off, Clock send on, Prog CH recieve off, Prog CH Send on and Thru Port function is DIN48, which is the port I am trying to use to sync. I believe you need to set the Digitakt's port to MIDI, not din sync, since you are trying to send the MIDI clock to the A-190-8. Din sync is different than MIDI. Yarns "outs" all MIDI channels it's not currently responding to so I have a permanent loop to the Midi Thing. Midi Thing also has a dedicated Clock and Start/Stop CV output which is incredibly useful. Ah awesome! I hooked the cable up to MIDI out instead of Thru and set it to clock instead of DIN Sync and now it works fine! I love the Vermona QMI with my OT. 4 voices of cv gate with 2 extra assignable cvs per voice. Also 3 different clock outs and a reset out. I second this. Been using this same set up and am happy. using fh-1 with digitakt,great !! first you can make custom setup for your needs,all out are configurable via the editor ( seems complicated but it's not at the end..) and also the great options to choose the voltage range of every out via jumpers,so handy. also parameter locks cc is cool.i have to try the arp,'cause digitakt miss one. I just got the FH-1 and I can't seem to be able to sync it with the Digitakt. Ideally I would like the FH-1 to send midi clock to the Digitakt (internal FH-1 clock or external clock sent to the FH-1's X input). I would try it the other way; you are trying to set it up to send the clock to the digitakt while it sends midi data back. It should work if you use the digitakt as master clock. Euro-Mideco! Converts midi signal to 24 gate output. Might not be as effective with the Digitakts mono sequencer but still insanely useful. I have one midi channel on the Digitakt sending a message every step which is going into a Pamela's New Workout to clock everything. Finally everything I have is now sync'd to my DAW for easy editing. Now it's time to practice hard until I get something that sounds okay out of it haha. So FH-1 (which I need a iconnect midi thingy), the polyend http://polyend.com/poly/, or the endorphins unless someone else has a suggestion? I think the Endorphin.es SC gates are 0-5v also. Don't think you need iconnect, can just use a usb cable from digitakt to dh1... or so I have gathered, not got one yet but thinking about it. Correct, no need for anything special, you can connect Digitakt to FH-1 using the USB cable that came with the DT. FH-1 + DT has been working great for me. I have running 4 CV/Gate Pairs, different synchronized clock´s and LFO´s with the endorphines shuttle control. Just plug the USB-Cable from the DT to the shuttle control and it just works. I'm looking into this as well. I've been happy with sequencing the modular within the modular for quite a while now, but after a couple months with the Digitakt I can't help but wonder how this wonderful sequencer would do to sequence my two voices (only have a 6u). Shuttle control seems like the most pain free module but it seems a bit overkill in my case. 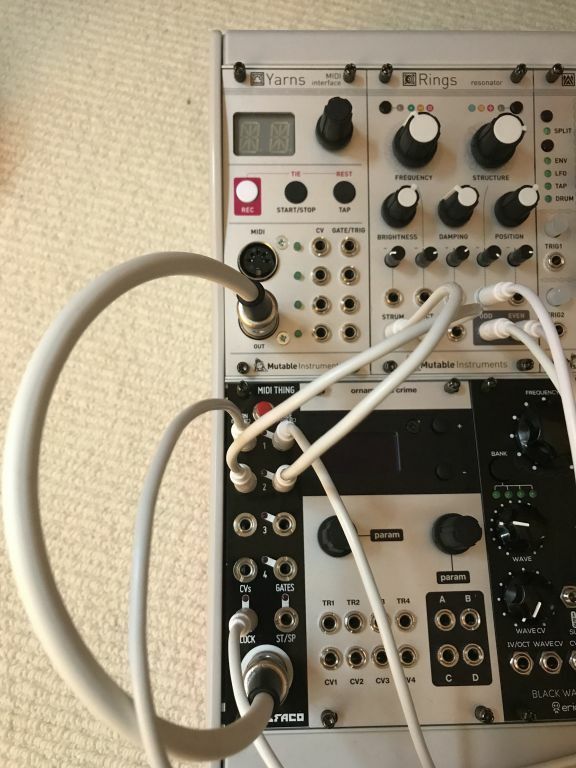 I have plenty of modulation available so I'm only planning on using 2 or 3 sets of CV/gate to sequence "techno loopy things" on my Loquelic and Cursus Iteritas. Also, my 6u is full, so any amount of hp in is the same amount of hp out. I can spare the Pamela expander (and maybe another bit&bob) so the Digitakt will now clock the modular instead of Pamela clocking the Digitakt like I have it set up now. In other words I need a module with clock out as well. I would have up to 8hp free. Befaco midi thing seems my best best so far or maybe the Erica Black midi v2 but maybe this one is more aimed at keyboards than sequencers ? Cv.OCD doesn't appeal to me that much, I'd rather not have another box on my tiny desk, so in rack is preferred. Edit : I should add that I've stayed clear of anything midi (apart from simple clock) so far as it seemed quite a pain to set up and prone to sucking time otherwise spent making music; but I'm willing to try to get the most out of the Digitakt and my modular ! I just bought a Doepfer A-192-1 (CV to MIDI module, not MIDI to CV) to control my Digitakt using CV and it seems very powerful so far. It provides 16 CV inputs and you can have gates triggering samples, pitch CV, CV control over sample slot and decay envelope, etc. This setup even allows CV control over the Digitakt's currently playing pattern! It's not the easiest thing to set up (needs custom configuration mapping), but I think it's going to be bonkers. Modular newbie here...What would be the disadvantage of 0-5v gates on the CV.OCD?